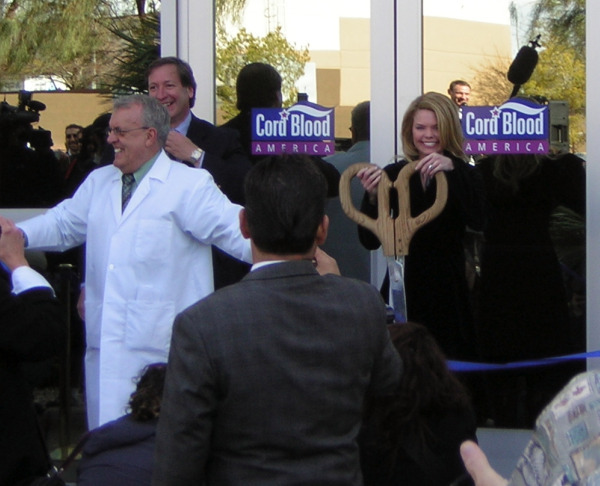 Cord Blood America, Inc.(CBAI), through its wholly owned subsidiary CorCell Companies, Inc., is engaged in the business of collecting, testing, processing and preserving umbilical cord blood, thereby allowing families to preserve cord blood at the birth of a child for potential use in future stem cell therapy. The umbilical cord which, at birth, traditionally has been thrown away, contains a rich store of stem cells. Cryogenically preserved umbilical cord stem cells have already been used to treat 75 major diseases, including leukemia, severe anemia, metabolic blood disorders and immune deficiencies. This list is guaranteed to grow as medical research learns more about the incredible healing power of stem cells. There is uniformity in the belief that stem cells will play a key role in fighting disease as we move forward through this century. Some scientists are confident that stem cells will launch a new era in medicine, perhaps even curing some of our most intractable diseases. CBAI offers extensive experience, with over 16 years in the cord blood banking industry, a proven processing model, technology and all the assistance our business to business clients need to grow their cord blood banking company without the additional cost of operating their own laboratory. CBAI is licensed in New Jersey, New York, California and Maryland and registered with the FDA. They are also a Clinical Laboratory Improvement Amendments (CLIA) certified laboratory. Cord Blood America's state of the art laboratory is located minutes from McCarran International Airport in Las Vegas, NV; with approximately 3,300 inbound flights per week they are able to receive customer samples 24/7/365. Cord Blood America is a fully licensed cord blood bank that has processed more than 27,000 cord blood units since first opening in 1996. The 17,000-square-foot facility is equipped with the most advanced processing and storage technologies. The facility is under 24 hour surveillance with stringent restricted access protocols your client's cord blood unit will be kept at the correct temperature at all times thanks to our 24 hour monitoring system. The Tissue Bank Director had more than 25 years of experience in the stem cell field. A staff of highly experienced health professionals and technicians, working under the guidance and expertise of CBAI's Scientific/Medical Advisory Panel of industry leaders, offers both technical skill and unparalleled leadership. This unique combination of talents ensures that the laboratory remains on the cutting-edge of new cord blood advances, while guarenteeing the safety, integrity and viability of your customer's cord blood unit. Blue Cross Blue ShieldOur current healthcare partners listed below have negotiated a special program for our customers to save cord blood for their children, grandchildren, nieces, nephews, friends or other loved ones. To learn more about our insurance partners visit the CorCell® website at www.corcell.com. August 11, 2017 - Cord Blood America, Inc. (www.cordblood-america.com) (OTC Bulletin Board: CBAI) ("CBAI" or the "Company") today announced financial results for the second quarter ended June 30, 2017. Total revenue for the second quarter was $0.75 million, a decrease of 5.9% from total revenue of $0.79 million for the second quarter 2016. Recurring storage revenue for the second quarter 2017 was $0.66 million, a decrease of 4.4% from recurring storage revenue of $0.69 million for the second quarter 2016. EBITDA for the second quarter 2017 was $0.20 million, an increase of 151.9% from EBITDA of $0.08 million for the second quarter 2016. For the three months ended June 30, 2017, total revenue was $0.75 million, a decrease of $0.04 million or 5.9% from $0.79 million in second quarter 2016. Of the $0.04 million decrease, approximately $0.03 million was attributable to the reduction in storage and processing revenue from a previously terminated agreement with a third party. The discontinuation of storage revenue from the third party accounted for the decline in the Company’s recurring storage revenue in the quarter. Gross Profit for the three months ended June 30, 2017 was $0.57 million, a decrease of $0.02 million or 3.6% from $0.59 million in second quarter 2016. Of the $0.02 million decrease, approximately $0.03 million was attributable to the reduction in storage and processing revenue from the third party, offset by reductions made by the Company in cost of goods sold. Gross Margin for the three months ended June 30, 2017 was 76.4% compared to 74.6% in second quarter 2016. Gross margin increased due to reductions made by the Company in cost of goods sold. Net Income for the three months ended June 30, 2017 was $0.15 million compared to a loss of $0.03 million in second quarter 2016. EBITDA for the three months ended June 30, 2017 was $0.20 million, an increase of $0.12 million or 151.9% from $0.08 in second quarter 2016 despite the reduction in revenue as the Company has reduced costs.